The Great Famine Voices Roadshow will be launched in New York on 9th April at the American Irish Historical Society. The Great Famine Voices Roadshow is a series of open house events in the United States and Canada that bring together Irish emigrants, their descendants, and members of their communities to share family memories and stories of coming from Ireland to North America, especially during the period of the Great Hunger and afterwards. “We are excited about meeting people during the Great Famine Voices Roadshow and hearing their family stories about how their ancestors came from Ireland to start new lives in the United States,” declared Christine Kinealy, Director of Ireland’s Great Hunger Institute at Quinnipiac University, Connecticut. “We hope that people of Irish heritage in Canada will come to the Roadshow to share their family memories,” added Professor Mark McGowan from the University of Toronto. “This Roadshow will provide a unique opportunity for Irish-Americans and Irish-Canadians to share their stories, strengthen their sense of ancestry, and historical and current Irish connections. All are welcome to these events”, said Caroilin Callery, a Director of the National Famine Museum in Strokestown Park, Ireland. “Over the past few years, we have been in search of stories from ‘the next Parish’ in North America, where so many of those who survived the Great Hunger – the biggest catastrophe of 19th century Europe – made new lives. We need to hear these stories,” she continued. The Great Famine Voices Roadshow in the USA and Canada will be hosted by the National Famine Museum at Strokestown Park, Ireland, and the Irish Heritage Trust, an independent charity. The Roadshow will be held in partnership with Ireland’s Great Hunger Institute at Quinnipiac University, the American Irish Historical Society, and the University of Toronto. It is funded by the Government of Ireland Emigrant Support Programme. DETAILS OF ROADSHOW VENUES – All Welcome to these Free Open House Events. April 15th, 1pm-4:30pm: Parkway Central Library, 1901 Vine Street, Philadelphia. April 17th, 11am-3pm: Knights of Columbus Museum, 1 State Street, New Haven, Connecticut. May 22nd, 5-9pm: Madden Hall, St. Michael’s College, 81 St. Mary Street, University of Toronto. May 27th, 10am-5pm: St. Gabriel’s Church, 2157 Centre Street (and Walk to the Stone), Montreal. An exhibition exploring the little known story of the Grey Nuns and other religious orders in Montreal, who provided care and shelter to Irish immigrants in Canada during the Great Hunger, will launch in the Russell Library on Wednesday, 8 November at 16.00. Saving the Famine Irish: The Grey Nuns and the Great Hunger was curated by Professor Christine Kinealy, Director of Ireland’s Great Hunger Institute at Quinnipiac University, and Dr. Jason King. One of the first priests to enter the fever sheds with the Grey Nuns was Father Patrick Morgan, who was ordained at Maynooth College in May 1842. Morgan was also one of the first clergy to perish from the typhus epidemic, dying on the 8 July, 1847. Saving the Famine Irish: The Grey Nuns and the Great Hunger exhibition features original material from the historical collections of Maynooth University and St. Patrick’s College, Maynooth including the matriculation entry for Father Patrick Morgan and a letter of introduction for Montreal’s Bishop, Ignace Bourget (1799-1885), who visited Maynooth in 1847 to recruit Irish missionary priests. The exhibition will run in the Russell Library until 25 January, 2018 and is free to view during the Library opening times of Monday, Wednesday and Thursday, 10:00 to 13:00 and 14:00 to 17:00. Beyond Black Rock: Plans for a memorial park to honour as many as 6,000 typhus victims from the Summer of Sorrow appear to be in jeopardy. What if thousands of people lay dying on Montreal’s waterfront? What if some of the city’s best doctors, nurses, members of the clergy and the mayor were caring for the sick newcomers at the risk of their own lives? What if the dead were being buried in hastily dug trenches next to the makeshift hospital, piled three coffins deep? What if the death toll rose to the equivalent of 12 per cent of the city’s population? You’d think a city couldn’t forget a thing like that. The events of Black 47 are very real to Montreal-born, Dublin-based historian Jason King. On visits to his hometown, King, academic coordinator for the Irish Heritage Trust, which operates the Irish National Famine Museum, always makes a point of visiting the site in Pointe-St-Charles where as many as 6,000 people died of typhus in 1847. King contemplates the stone in silence, broken only by passing vehicles, the sighing wind and screeching of seagulls. “You do feel a real sense of connectedness when you come to the actual place,” he says. “Usually, when I come I’m by myself. There’s really nobody here. There’s passing traffic, but that kind of becomes white noise after a minute or two. The rock and the strange, empty parking lot. It’s a very moving site, a very strange site,” King says. Dozens of cities, including Toronto, New York, Boston and Philadelphia, have sites commemorating the one million Irish who fled their homeland during the Great Famine of 1846-51 — of whom an estimated one in five died en route of disease and starvation. Each year, some 20,000 tourists journey to Grosse-Île, the former quarantine station near Quebec City where more than 5,000 famine migrants died in 1847. But Montreal, whose Black Rock is the world’s oldest famine memorial, has no appropriate place of remembrance — just this dangerous spot in the middle of a busy commuter route. Google Earth image shows location of the Black Rock. The proposed memorial park would be built on land now occupied by the parking lot above it, and cement site to the left. Yet it was in Montreal that the tragedy struck hardest, and that the community most heroically rose to the challenge of helping the sick and dying, King says. “Montreal was in a sense the epicentre of the 1847 famine migration,” he says. For the past five years, members of the local Irish community have been working to create a memorial park honouring those who fled the famine, only to die on Montreal’s waterfront. Their plan calls for moving the Black Rock to the future park on the east side of Bridge St. at rue des Irlandais, an area now occupied by a parking lot and Lafarge cement site. But in May, organizers of the Montreal Irish Monument Park Foundation learned the land earmarked for the park had been sold to Hydro-Québec, to build an electrical substation to supply the future Réseau électrique métropolitain (REM) train. Mayor Denis Coderre, who had initially pledged support for the park, now insists the substation must go ahead but has promised to find a compromise. Coderre and other city officials refused to be interviewed for this article. The city is also keeping mum on its plans for the rest of the area between Bridge St., the Bonaventure Expressway and Mill St. — formerly the working-class neighbourhood of Goose Village, which the city demolished in 1964. The Coderre administration is reportedly eyeing the site for a future baseball stadium, to bring back Major League Baseball to Montreal. “The Goose Village sector is targeted in the Stratégie Centre-Ville (a downtown development plan) which will be unveiled in the near future,” is all city spokesperson Jules Chamberland would say in an email exchange. The REM project calls for a light-rail station underneath the Lachine Canal’s Peel Basin, with a north entrance in Griffintown and a south entrance about a 10-minute walk from the Goose Village site. But to King, any project that brushes aside the site’s tragic history would be a violation of the last resting place of the thousands who died. “You can’t imagine this happening anywhere else, that you’d have a mass grave in complete abandonment,” he says. Sylvain Gaudet, a researcher with the Société d’histoire de Pointe-Saint-Charles, has pored over newspapers, maps and property records to document the burial grounds where the typhus victims were laid to rest. Initially, the sick were housed in sheds near the Peel Basin; later, sheds were built for them on the Goose Village site. Archaeological research is needed to determine what traces remain of the thousands buried at the two sites, Gaudet said. Anne-Marie Balac, an archaeologist who worked for Quebec’s Ministry of Culture for 27 years and is now a consultant, said “it’s unthinkable” to allow any project to be built without a thorough investigation of what lies under the ground. “We know it has a very high archaeological potential because it’s a cemetery,” she said. Several bodies have been unearthed over the years, including during roadwork and building of the Costco, leaving no doubt that the site is a former cemetery, Balac said. In 1942, excavations near the entrance to the Victoria Bridge turned up the coffins of 12 typhus victims in a trench-like grave. They were reinterred near the Black Rock. “It’s urgent to act before going too far,” Balac said. In the spring of 1847, Montrealers braced for an influx from famine-stricken Ireland, where the potato crop had failed in both of the previous two years. “We learn from British papers and private letters published in those of the United States, that the preparations for emigration from Britain, and especially from Ireland, are unprecedentedly great,” the Montreal Witness newspaper reported on March 8. Fearing a deluge of undesirables, the United States tightened regulations for passenger ships, pushing up travel costs. This meant the poorest immigrants would be forced to travel via Quebec City and Montreal, the Witness correctly predicted. Soon “our shores are likely to be thronged with emigrants, chiefly of a class who will have little or nothing left when they arrive,” the paper warned, urging that “no time ought to be lost” in making preparations. But nothing could have prepared Montrealers for what they saw when sick and starving immigrants began stepping off steamboats from Quebec City. “Good God! What a spectacle. Hundreds of people, most of them lying naked on planks haphazardly, men, women and children, sick, moribund and cadavers; all of this confusion hit the eyes at once,” the Annals of the Sisters of Charity (Grey Nuns) reported on June 7. “Hundreds of poor people, men, women, and children of all ages, from the drivelling idiot of ninety to the babe just born, huddled together without light, without air, wallowing in filth, and breathing a fetid atmosphere…” Irish landowner and social reformer StephenDe Verewrote of a crossing to Quebec in 1847. A foul odour wafted from the immigrant ships, like the stink of a dunghill on a foggy day, observed Grosse-Île’s medical superintendent, Dr. George Douglas. “I never saw people so indifferent to life – they would continue in the same berth with a dead person until the seamen or captain dragged out the corpse with boat hooks,” Douglas wrote in a letter to the chief immigration agent in Quebec City. Of the 100,000 who sailed for British North America in 1847, an estimated 70,000 arrived in Montreal, then a town of 50,000. At first, the sick were housed in existing sheds on the south bank of the Peel Basin of the Lachine Canal. As the epidemic spread, prominent citizens demanded that a quarantine station be set up on the Boucherville Islands. But authorities rejected that idea as impractical and decided to build new sheds on the shore of the St. Lawrence, approximately where the Black Rock stands today. At the time, the site was on the waterfront but today the river is farther away because landfill has altered the shoreline. Those who died were buried next to the sheds, in long trenches where the coffins were piled three deep. “The sheds were more or less here, on the waterfront,” King says. “On the one hand, it’s a scene of utter desolation and desperation, with hundreds of people dying in abject misery, but also there’s a lot of compassion and there’s a lot of caring towards them,” he says. While the tragedy was the city’s darkest moment, it was also in some ways its finest hour, he says. “For all of the deaths, all of the anxiety and the fear, it’s in many ways a positive story. It’s a story of self-sacrifice, a story of people rising to the occasion,” he adds. Nuns, priests, Protestant clergy and others disregarded their own safety to care for the newcomers. The Mohawks of Kahnawake brought food for the starving strangers. “These are much, much bigger challenges than we can possibly imagine. When there were real risks, we accepted them all, with a generosity of spirit I think we rarely see today anywhere,” King says. Estimates of the death toll in Montreal in 1847 vary from 3,579 by Nov. 1 — the number reported by Canada’s chief immigration agent in Quebec City — to the 6,000 recorded on the Black Rock, which includes deaths in 1848. In its report for 1847, the city’s emigration committee stated 3,862 died of typhus in Montreal that year. Quebec families adopted hundreds of Irish orphans at the urging of Catholic bishop Ignace Bourget. Their descendants are among the 40 per cent of Quebecers who claim some Irish ancestry. “When the Irish settled in urban areas, they became English. When they settled in rural areas, they became French-Canadian, retaining their Irish surnames but otherwise indistinguishable from everyone else,” King notes. Today, as Haitian asylum-seekers are sheltered in the Olympic Stadium and Syrian refugees adjust to life in Canada, the city’s response to the famine migrants of 1847 sends a powerful message, King says. “After that initial moment of panic, it’s a story of people becoming accepted into their new communities, people becoming new French-Canadians or Irish-Canadians,” King says. Numerous sources, including records kept by religious communities and newspaper reports, paint a vivid account of the famine migration to Montreal. Editorial: Forget granite stumps. What about the Black Rock? “One of the most remarkable things is that the Annals of the Grey Nuns are one of the most detailed records of any famine site anywhere in the world,” historian Jason King says. “There are very absorbing descriptions of people arriving in unprecedented numbers,” he says. Local newspapers recounted the evolving crisis and vigorously debated on how it should be dealt with. June 7: When sick and starving Irish immigrants begin arriving in Montreal, the Grey Nuns step forward to nurse them. Our Mother Superior heard that there were a great number of sick people lying outdoors along the docks and that they found themselves in the saddest of shape. After going out to investigate, she returned to the Mother House to describe the horrific condition of the immigrants and ask for volunteers. She did not need to do so more than once, since our dear Sisters came in large numbers. June 13: As thousands pour into the city, the typhus sheds near the Lachine Canal are quickly overwhelmed. Patients are crowded three to a bed, with corpses lying alongside the living. Bodies pile up outside, awaiting burial. The Grey Nuns record heartrending scenes, like a man who arrives from Grosse-Île searching for his wife, who had been sent on to Montreal before him. He finally spots her corpse on a pile of bodies and takes it in his arms, calling her name and kissing her, unable to believe that she is really dead. Once he is convinced that she no longer exists, he abandons himself to his pain; the air is filled with his cries and sobs. … Scenes of this nature occur several times a day. June 21:With deaths from typhus averaging 20 per day, newspapers praise the tireless devotion of the nuns, priests and doctors caring for the patients around the clock. Most heartbreaking is the plight of the orphaned babies. The most piteous sight of all, perhaps, is a separate shed, appropriated to the orphans, and in which sixty or eighty poor little creatures, some of them not many weeks old, are lying four and six in a berth, many of them wailing in every variety of tone. The priests, nuns, and others, are very attentive to these forlorn babes; but there appear to be no wet nurses yet, and it is almost impossible that many of them can survive. June 24: Bishop Ignace Bourget calls on Quebecers to adopt the orphaned children. July 4: With caregivers falling ill, critics suggest it was a mistake to help the newcomers. We very much regret that the church authorities allowed the hospital sisters to leave their convent to care for the sick. … This kindness towards the emigrants seems to us a little exaggerated. If the government wants to send us so many of these unfortunate people, who are bringing plague and famine here, it’s up to the government to care for them and support them. Front page of The Montreal Witness, March 15, 1847. July 5: Workers succumb to typhus as the disease spreads. There is not a doubt now that the fever, which is the prevailing malady among these immigrants, is highly contagious. Mr. Yarwood’s (the immigration agent for Montreal) death has already been mentioned, and we are sorry to add that two or three of the doctors here are ill, including Dr. Liddell, the chief emigrant physician. Nineteen of the nuns are said to be more or less sufferers from the prevailing malady, and many of the other nurses have been laid down by fever. The disease is also spreading through the city. July 12: Debate rages over where to construct the new hospital sheds. Prominent citizens call for the immigrants to be moved to the Boucherville Islands, where they will not infect local residents. But the Medical Commission, headed by Mayor John Easton Mills, nixes that idea, saying doctors and nurses could not be found to work there and that steamships would not be able to dock there. July 15: More than 1,000 citizens attend a protest meeting at Bonsecours Market on July 13 demanding the immigrants be removed to the Boucherville Islands site. The great majority of citizens want the emigrants to be moved elsewhere to prevent the contagion that is decimating our city but the authorities are opposing them! … Ministers, priests, nuns and citizens have already paid for their devotion with their lives, many others are at death’s door, while they pretend to believe that there is no danger and refuse to remedy the situation. In relation to the self-sacrificing spirit which actuated the whole Roman Catholic and Protestant Clergy of Montreal … there can be but one opinion, and that opinion pervades all classes and conditions of our population. We speak with the soberness of truth when we say that they have shown a zeal in the cause of suffering humanity rarely equalled, certainly not surpassed — worthy indeed of their august and sacred calling and honourable to the character of that religion whose doctrines they are appointed to teach. Aug. 13: Bishop Bourget pays tribute to fallen nuns and priests. Since the 8th of July, the Lord has visited us to take away eight Priests, 10 Nuns and a large number of laypersons who devoted themselves, with praiseworthy zeal, to the spiritual and bodily service of the sick. Alas! This pitiless illness has reached these heroines of Catholicism. … They have fallen, they who, like angels of peace, consoled so many tortured souls. John Easton Mills was the mayor of Montreal from 1846 to 1847, when he died of typhus. Nov. 15: Mayor Mills dies. It is with profound grief we announce to our readers the death of John E. Mills, Esq., Mayor of this City, of typhus fever. This melancholy event which took place last Friday morning (Nov. 12) at 11 o’clock, has caused a deep feeling of sorrow throughout every class in the community. The National Famine Walk will take place over six days from May 27th to June 1st as an international group of Famine scholars follow in the footsteps of the 1,490 tenants from Denis Mahon’s Strokestown Park House estate, who were escorted by a bailiff to Dublin to ensure they boarded ship and left Ireland in 1847. Walkers will cover 155km from Strokestown along the Royal Canal to Spencer Dock, passing the Jeannie Johnston Famine Ship and Rowan Gillespie’s Famine sculptures before arriving at the EPIC Irish emigration museum on Dublin’s Custom House Quay. President Higgins will greet them at Richmond Harbour in Clondra, Co Longford on May 27th to send them off. The tenants’ fate after they left Dublin is a harrowing one. They travelled on open deck packet steamers to Liverpool, where they waited in the cellars of quayside buildings at Liverpool docks to board ships to Canada. The four ships they boarded – Erin’s Queen, Naomi, The Virginius and The John Munn – were badly fitted out and poorly provisioned. Almost half of those who embarked died aboard ship or in the “fever sheds” at the Grosse Île quarantine station when they arrived in Quebec. Of course, this was not known to them as they walked along the Royal Canal to Dublin, away from hunger and hoping for a better life. The National Famine Walk begins at one of the numerous points of origin for what has been an ongoing research initiative to document the passage of more than 100,000 tenants forcibly exiled to Canada in 1847. The transatlantic voyage and passage along the Saint Lawrence river from Quebec to Toronto resulted in the second greatest loss of life in the Victorian era, second only to the Crimean War. Of those who left, more than 20,000 perished at sea or along the Saint Lawrence River, marking Canada with the infamous distinction of having the largest Irish mass graves outside of Ireland. The 1847 evictions, transfer and passage to Canada encapsulate a twice-told tale. First, it’s a story of British government and Irish landlord neglect. Mahon evicted 3,006 tenants and paid just under £4,000 for the passage of almost 1,000 of those he assisted to emigrate. For his unfailing cruelty, on November 2nd, 1847, Mahon was shot to death as he travelled home to Strokestown House from a Board of Guardians meeting. Murder was not a deterrent for the landlords. Evictions continued until some 11,000 persons of the 12,000 tenants were removed from Mahon’s estate. In exporting evicted tenants, passage to Canada proved the cheaper alternative to America, given that the American authorities, anticipating the influx of a starving flotsam of Irish, amended their maritime Passenger Acts. Imposing stricter regulations, the acts barred disease-ridden ships from arriving into American ports. In 1847, the most destitute Irish emigrants were sent to the British North American colonies in New Brunswick and Canada East and West (Quebec and Ontario) on retrofitted lumber vessels as human ballast. These coffin ships averaged over 300 persons per vessel, three times that allowed under the American Passenger Acts. Mortality rates approached 40 per cent. The story of emigration to Canada is, secondly, a contrasting one of succour and sacrifice, as a predominantly Catholic, French Canadian province of Quebec braced for and ministered to a dispossessed, disease-ravaged people in one of the greatest unrecognised human refugee crises of the 19th century. The immigrant numbers are extraordinary. Most of them arrived at Grosse Île in Quebec, which is now a National Historic Site with a glass wall memorial for the 5,000 Irish interred in mass graves on the island. Grosse Île is twinned with the Irish National Famine Museum at Strokestown Park House, where Taoiseach Enda Kenny unveiled a similar glass wall memorial to its missing 1,490 emigrants in 2014. Many of those 1,490 emigrants died on Grosse Île. It was there that James Quinn, a 45-year-old Irish emigrant from Lissonuffy, on the Strokestown Park estate, whispered his dying words to his two young sons, Patrick (12) and Thomas (6): “Remember your soul and your liberty”. The orphaned Quinn brothers were adopted by a French-Canadian family who gave them a good education. They both entered the seminary and became priests with joint French and Irish congregations. In 1877, Patrick Quinn founded the still flourishing St. Patrick Society in Richmond, Quebec, where there is a theatre named after him. His younger brother, Thomas Quinn, became a champion for his French-Canadian parishioners. Like the Quinn brothers, Daniel and Catherine Tighe also sailed to Grosse Île where they were orphaned, adopted by a French-Canadian family, and allowed to keep their Irish surname. In 2000, Jim Callery, founder of the Irish National Famine Museum, visited Daniel’s son Léo Tye in rural Quebec and heard the story that inspired the search for the missing 1,490 Strokestown emigrants. 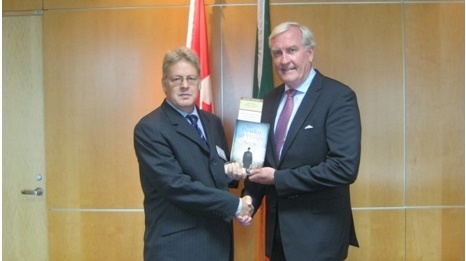 He also unveiled a Celtic Cross Famine memorial in Quebec City that he had donated on behalf of the Famine Museum. In July 2013, Léo’s son Richard Tye made a return visit from Quebec to Strokestown, and was reunited with the Irish branch of the family. His Irish cousin Philip Tighe will be on the National Famine Walk. The suffering of Famine emigrants was not confined to Grosse Île. With the arrival of 75,000 typhus-afflicted refugees, the city of Montreal, then a city of 50,000, hastily erected fever sheds to contain disease. The Annals of the Grey Nuns, a recently translated cache of diaries, details the convergence of municipal and religious groups involved in saving Irish lives, often at great personal cost. Notable casualties included the Protestant mayor of Montreal and myriad priests and nuns who worked the fever sheds of Pointe Sainte Charles. In the wake of the emigrant passing through Montreal, over 3,000 Irish orphan children left in the care of religious orders were eventually adopted, like the Quinn and Tighe siblings, into French-Canadian families. The journey onward into Ontario has its own history. Less a story of commonality and religious succour, the death toll is lower, given how most afflicted died at Grosse Île and Montreal. Also, a subtle sectionalism led to journalistic self-censorship in accurately chronicling the passage and burial of those who died along riverside towns throughout Ontario. Such was the forgotten history of Canadian involvement with the fated year of 1847, simply because the crisis and sacrifice had happened so far away, within a single season. For the most part, accounts of the worst suffering were recorded in French, so the episode closed in the forgotten reaches of Quebec. That is, until recently. In 2016, Irish author and ultra-runner Michael Collins ran a marathon-a-day for a month from Grosse Île to Toronto; he was inspired by his reading of the Grey Nuns’ annals. En route, along the Saint Lawrence, he met historical societies researching their town’s archives and recorded anecdotal stories passed down by descendants, which he documented on his Irish Diaspora Run 2016 Facebook page. More than 100,000 people visited the page during the run, and he has reactivated it for the National Famine Walk. The project continues. At Grosse Île quarantine station, a memorial serves as a cautionary reminder of what can befall a dispossessed people, and at the terminus of the route in Toronto, Ireland Park has become a place of pilgrimage, memorialising the passage of 1847. 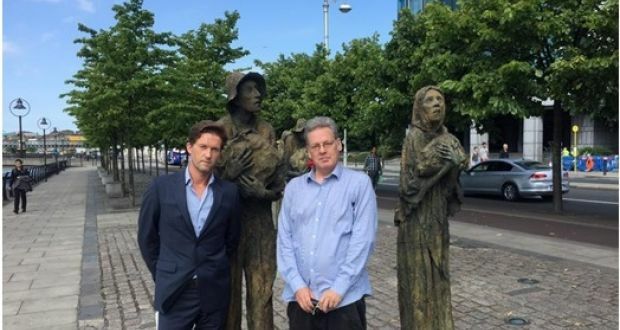 Situated along Toronto’s docklands, a series of Rowan Gillespie Famine sculptures reach back across the ocean to Gillespie’s Famine sculptures on Dublin’s Custom House Quay Docklands. Without descriptive plaques detailing the history of 1847, the sculptures simultaneously encompass and transcend Irish history, evoking the universality of the immigrant experience, both past and present. In the furtherance of peace, Ireland Park Foundation has reconfigured a national tragedy, not as a source of differentiation, but of shared experience. In 2017, the foundation will unveil Dr George Robert Grasett Park, celebrating the efforts of the Canadian medical profession which so tirelessly worked to save both those who arrived and Toronto’s own citizens from disease. What remains yet to be memorialised is Montreal’s response to 1847. Specifically, The Black Rock memorial, a stone hastily erected by workmen who uncovered over 6,000 bodies during the 1859 construction of the Victoria Bridge, lies in the median of a major arterial in downtown Montreal and is in jeopardy of being summarily removed as the city plans a major overhaul of the area. The Montreal Irish Monument Park Foundation is locked in a tenuous battle with city, provincial and federal authorities to preserve and allocate what is currently an abandoned parking lot as the future site of a memorial grounds honoring both the 1847 emigrants and those who came to their aid. The National Famine Walk complements these projects to ensure that Famine emigrants like Strokestown’s missing 1,490 are commemorated on both sides of the Atlantic. In following in their footsteps, the walkers are not only honouring their legacy. They are embarking on a journey to trace the descendants of the 1,490 emigrants in Canada and the United States, especially from Irish Famine orphans adopted in Quebec. 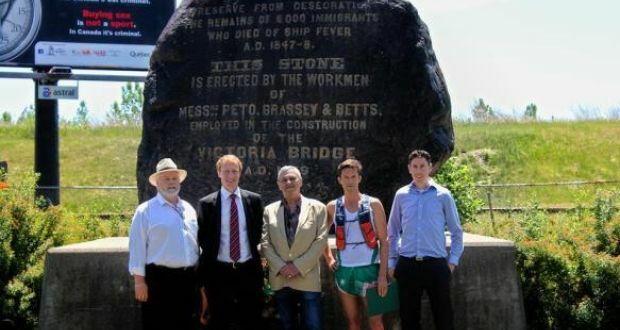 They are also laying the foundation for a permanent walking trail along the Royal Canal between Strokestown and Dublin, the National Famine Way. With its advent, hitherto inaccessible paths are providing opportunities to walk in the footsteps of the dispossessed. 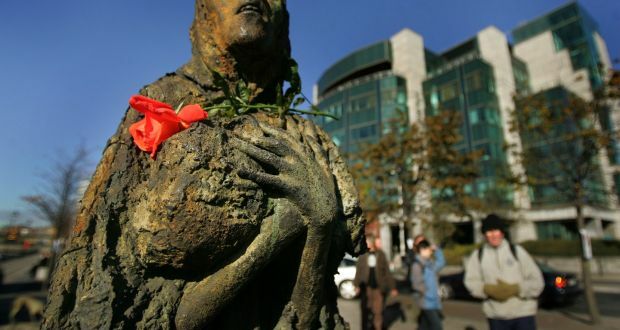 Prof. Christine Kinealy (and founding director of the Ireland’s Great Hunger Institute at Quinnipiac University) talks to ADAPT about the cultural impact of the great famine and how it influenced Ireland in years to come. Author Cathal Poirteir tells about the particular character from the 1,490 who left Strokestown, one John O’Connor. His story is a tragic one as he died during the famine, but not from hunger! The Famine walkers’ journey from May 27th to June 1st can be followed in real time at http://www.nationalfamineway.ie. Famine Way Walkers Re-enact the arrival of the 1,490 at Spencer Dock, Dublin. Having waked from Strokestown, Co Roscommon, Famine Way Walkers 2018 re-enact the final steps journey of 1490 migrant tenants from Strokestown as they made their way towards the replica famine ship, the Jeanie Johnston. This is a playlist of three short but separate videos. The National Famine Way is being developed by Strokestown Park House, the Irish National Famine Museum, and the Irish Heritage Trust in partnership with Waterways Ireland, the ADAPT Centre for Digital Content Technology, Ireland’s Great Hunger Institute at Quinnipiac University, Ireland Park Foundation, the University of Toronto, Royal Canal Amenity Group, Roscommon and Longford County Councils, and Strokestown Community Town Team. On day five of the walk, the walkers met with Dr Ciarán Reilly who gave them a tour of the Carton House estate near Maynooth. Dr Reilly is the leading expert on the Strokestown Park Archive and one of the most distinguished scholars in the field. His book Strokestown and the Great Irish Famine (Four Courts, 2014) combines incisive analysis of the records in the archive with high quality reproductions of some of its most important documents. ‘The most in-depth study of the effects of the Famine on a landed estate and its community … With the help of this book, we are brought deep inside the actuality of life during the Famine era. Some of our preconceived ideas of what actually transpired during that appalling era are challenged. Highlighted too is the important role played by the Irish National Famine Museum at Strokestown’, from the foreword by Mary McAleese, former President of Ireland. The Strokestown Park House archive is one of the largest Irish estate collections in existence, with more than 50,000 documents comprising rentals, leases, accounts, correspondence, maps, drawings, architectural plans and photographs. Of particular importance are the papers that relate to the Great Irish Famine. This book aims to introduce the reader to the archive and to provide a fascinating and detailed insight into the many and varied experiences of the Famine for those who inhabited the estate in the 1840s. While the Strokestown Park archive provides a fascinating insight into people who emigrated during and immediately after the Famine, their fate afterwards is more difficult to track. For the vast majority we are offered only fleeting glimpses of their lives after leaving Ireland. An example is John Coleman, one of ninety-nine emigrants who left the townland of Curhouna during the assisted emigration programme of 1847. Having survived the crossing, Coleman made his way to New Orleans where by 1851 he was listed as being a patient in the city hospital. One of 1,100 men and women, including over 20 Roscommon natives, who sought medical treatment in the hospital in 1851 alone, the ultimate fate of Coleman is unknown. Likewise, Margaret Flynn, aged 24, and her son John, aged one, who were described as “destitute”; having survived the voyage on board the Virginius in July 1847, they made their way inland to St John, New Brunswick, where they found shelter in the city’s almshouses in 1851 (139-142). Ciarán Reilly has also co-authored Women and the Great Hunger with the Famine walkers Christine Kinealy and Jason King (Cork and Quinnipiac University Press). Ciarán Reilly has also published The Famine Irish: Emigration and the Great Hunger (History Press, 2016), which includes Jason King’s chapter about the 1490 entitled “Une Voix d’Irlande: Integration, Migration, and Travelling Nationalism Between Famine Ireland and Quebec in the Long Nineteenth Century”, 193-208. In Michael Collins’s novel The Death of All Things Seen, native Canadian woman Ursula reflects on the forgotten “great lessons” of animal and human migrations. She “talked of First Nations people who bore witness along the Saint Lawrence, in the aftermath of the demise of the salmon, to the arrival of a great spawn of a new human misery, the portal, wide-eyed coffin ships, unloading a grim discharge of Europe’s flotsam. The Irish, most notably, those awful, pale-faced, skeletal wretches, ragged in the embattled way salmon rushed headlong against the current in a death run for the spawning grounds to seed the next generation”. It is a strikingly original metaphor for the Irish Famine migration of 1847. But the metaphor of spawning also marks Collins’s creative process, his return to the original source and difficult subject matter from which his literary career began. In an earlier Irish Times article entitled “Remembering 20,000 Famine refugees who died in 1847,” (November 26th, 2016) Collins recalled the creative block he suffered when he began to write a Famine novel and establish his reputation. In his own words: “I would spend a year researching the historical record and in the end wither from the burden of inhabiting the psyche of either the Irish peasantry or the landed aristocracy”. The sublimation of Collins’s Famine novel into his rendering of the rust belt in The Keepers of Truth was the making of his literary career, one that now spans 10 works of fiction. His penetrating insight into the lives of the struggling white working-class Americans who people his novels set in the de-industrialised mid-western United States seems prescient now that they have played such a crucial role in delivering the Trump presidency. No doubt the Clinton political machine would have been better served by eschewing data driven micro-messaging in favour of lively discussions and character analysis of Collins’s works. As the documentarian of another history, his Booker nomination was no small compensation for his unfinished juvenilia. Yet something was lost in Collins’s failure to complete his Famine novel. It is a genre that has come into its own with Sebastian Barry’s Costa Prize winning gay romance Days Without End (2016), Emma Donoghue’s acclaimed The Wonder (2016) and Joseph O’Connor’s intricately-plotted, faux-Victorian murder mystery and bestseller Star of the Sea (2003). Michael Collins has spawned new forms of creative energy in finding his own way back to the genre. One of his outlets is the extreme travel writing he pioneered fusing the roles of author and athlete when Collins ran over 900 kilometres last summer in the footsteps of the Famine Irish from the Grosse Ile quarantine station in Quebec to Ireland Park in Toronto. Not only did he run a marathon a day every day for a month, but he also filed crisp and incisive stories about his discoveries and the people and places he encountered along the route that could only be the envy of more sedentary, desk bound writers. Before embarking on the run, Collins had paid a visit to the Saving the Famine Irish: The Grey Nuns and the Great Hunger exhibition at Quinnipiac University which was launched by President Higgins when it transferred to the Glasnevin Museum in September 2016. He also read the eyewitness testimonies of the Grey Nuns who cared for Famine Irish emigrants in the fever sheds of Montreal in the digital Irish Famine Archive that I curate. “The most striking fact that emerged in reading the transcribed documents from the time was,” for Collins, “how the municipal authorities, in tandem with the religious orders of Montreal, had marshalled their collective resources to care and minister to the sick and dying Irish,” especially the hundreds of orphans who were adopted by French-Canadian and Irish families. Yet he was also struck by the sheer incongruity between the Grey Nuns’ stories of compassion, devotion, and self-sacrifice and the stark Black Rock memorial that marks the site where 6,000 Irish fever victims lie buried. It is not only the largest Famine Irish mass grave in North America, but also the most dangerous visit. Indeed, it is situated on a traffic meridian on the busy highway approaching the city’s Victoria Bridge, built by Irish labourers in 1859, while the remains of the Famine dead lie under the asphalt of an adjacent, overflow parking lot that is owned but rarely used by Lotto Quebec. “Why are 6,000 Irish buried under a Montreal traffic island?” Collins asked in one of his Irish Times articles during the run (June 23rd, 2016). It is a question that far too few Quebecers ask themselves. The Black Rock is also the grave site for some of the 1,490 tenants who were forced to emigrate in 1847 on some of the worst of the coffin ships, such as the Virginius and the Naomi, from the Strokestown Park House Roscommon estate of Major Denis Mahon (who was assassinated in November 1847), now the home of the Irish National Famine Museum. From May 27th to June 1st, 2017, Michael Collins will be joining a group of Famine walkers to follow in the footsteps of these 1,490 Famine emigrants from Stroketown to Dublin along the Royal Canal. The Famine walk is being organised by the Irish Heritage Trust and Famine Museum in partnership with Waterways Ireland to help establish a new Famine trail. The journey will provide Collins with a new narrative arc to follow the one he created during his Irish Diaspora Run 2016. It is also the narrative arc of a writer returning to his unfinished Famine novel. My relationship with The Irish Times started last year when I approached its books editor Martin Doyle about running a marathon a day from Grosse Île to Toronto. He graciously agreed and found funding for me through the Department of Foreign Affairs’ Global Irish Media Fund. In the year of preparation, both in the (over 6,000) miles run and relying on the support from Famine scholars Dr Christine Kinealy and Dr Jason King, I owe a debt of gratitude. I would also like to acknowledge the help and support of the Montreal Irish Monument Park Foundation and Ireland Park Foundation, Toronto. Though separate entities, they are bookends to a Canadian passage along the Saint Lawrence and their organisational resources have allowed scholars to further research the passage from Quebec into Ontario, two disparate and unique histories that are now being explored in earnest. Many of the towns that I passed on my run had erected Celtic crosses in remembrance of those Irish who died along the route of the Saint Lawrence. Much of the historical record, including the location of the mass burial of the typhus victims, was lost until Dr King began his research. Efforts are underway to create a virtual historical tour of the journey. With the completion and release of my 10th book, I have sought to reorient myself toward my own sense of Irishness. Perhaps it is an immigrant lament, but in the accumulation of years since I left Ireland, and with the advancing years of my four children, I feel an obligation to re-engage and better understand what it is to be Irish. We are remembered in the historical record as victims, as a people of a terrible genocide or famine. Indeed, even giving our suffering a name had been a cause of contention. For many, the rediscovery of a historical event some 150 years past has opened deep psychological scars. Of the 100,000 visitors to our page, many are now availing of online genealogical resources, and adding to the collective story of the passage and eventual settlement of those immigrants who crossed in 1847. The fated story of families separated through quarantine is a recurring motif. For a decade after the passage of 1847, notices appeared throughout Ontario with relatives inquiring after their loved ones. We are actively collecting and collating these accounts. Indeed, for many of the diaspora Irish I met along the run, the ancestral passage to Canada and America, especially during the hunger years, is still perceived as a form of exile connected to draconian British rule. In total, the Great Hunger accounted for the emigration of more than a million and the death of another million. Even contemporary descendants far removed from the tragic departure of the Hunger years, when asked to reflect on their ancestors’ arrival to Canada, were more apt to characterise it as an exile than an opportunity. The journey continues. I am participating in a sponsored walk from May 27th to June 1st, 2017, organised by The Irish National Famine Museum. Starting from Strokestown Park House along the Royal Canal and continuing to Dublin, the walk retraces the route of the 1,490 tenants who were forced to emigrate to Quebec in 1847. The museum is also launching a campaign to try to find as many living descendants of the original 1,490 Strokestown emigrants as possible. Ireland’s President Michael D Higgins will greet the walkers along the route. Again, I am indebted to so many for a year of writing and running, and for being granted the opportunity to reconnect with those at home and afar. On May 11, 2014, Taoiseach Enda Kenny unveiled a glass wall memorial to the 1490 emigrants during the National Famine Commemoration at Strokestown. Colin McMahon has traced the 1490 orphan James Flood’s movements between Strokestown, Liverpool, Grosse Île and Montreal in an article entitled “Recrimination and Reconciliation: Great Famine Memory in Liverpool and Montreal at the Turn of the Twentieth Century,” Atlantic Studies: Global Currents 11.3 (2014): 344-64. The Famine influx has long been an emotionally charged and politically potent memory for Irish groups in Liverpool and Montreal, not only because of the devastation wrought in their port cities in 1847, but also for its evocation of the calamitous condition of Ireland that led to the harried exit of the Famine Irish from their homeland. We can catch a glimpse of the horrors of this phase of Famine migration by tracing the route of one Roscommon family, the Floods, who, having lost their land and livelihood, fled Ireland in the spring of 1847. Mary and James Flood Sr. and their nine children were among the first contingent of 465 tenants that were evicted from the Strokestown estate and participated in a landlord-assisted emigration scheme that took them on a harrowing three-month journey through the Irish midlands, over the Irish Sea to Liverpool, and across the north Atlantic to Montreal. Their landlord, Major Denis Mahon, calculated that the expense of overseeing the large-scale clearance and transatlantic shipment of his smallholders who had neither food to eat nor money to pay rent would amount to less than half the cost of maintaining them in the workhouse for a single year. The first stage of their journey out of Ireland began with a 150-kilometre trek from Strokestown to Dublin. After four days of trudging cross-country and sleeping rough, the Floods and their neighbours arrived on the outskirts of the Irish capital. From there, they were escorted by the estate’s bailiff to Eden Quay on the River Liffey, where Major Mahon’s land agent awaited to oversee their passage to Liverpool. The inexpensive cross-channel voyage took less than a day, but the rough currents of the Irish Sea would have made it a distressing experience for this already malnourished group of migrants who were packed together on deck and in the holds of a steam-driven ferry. Disembarkation at Liverpool’s Clarence Dock offered little respite. The Flood family and the other Strokestown migrants represented a mere trickle in the deluge of over one million Irish into Liverpool during the Famine years, most of them in search of a cheap berth on a vessel bound for North America. Entering Europe’s busiest port, with “thousands of hungry and half naked wretches…wandering about, not knowing how to obtain a sufficiency of the commonest food nor shelter,” the destitute Irish were easy prey for sharpers and harpies, “the most unscrupulous set of scoundrels” notorious for bilking hapless newcomers to the city of the little they possessed. Even a brief stopover in this “City of Plague” exposed many Famine Irish to typhus, a disease that had reached epidemic proportions in the city by May 1847. Despite quarantine facilities at the Brownlow workhouse, on the waterfront, and aboard three government supplied quarantine ships docked on the River Mersey, the louse-borne bacterial infection stalked Irish migrants upon boarding vessels that had been hastily converted for the emigrant trade between Liverpool and British North America. The Floods survived their week long stay in a north-end lodging house in Liverpool awaiting embarkation, but would suffer terribly on their voyage to Quebec, arranged for them by their landlord. Opting for the cheapest fare his land agent could find, Major Mahon sent his former tenants across the Atlantic on a vessel that would soon gain infamy as a ‘coffin ship’. During the two month passage the Flood family and their former neighbours struggled to survive on paltry provisions while lodged in the bowels of the Virginius—a dank, insanitary, suffocating space below the foredeck that was a breeding ground for dysentery and typhus. In conditions likened by The Times to “The Black Hole of Calcutta,” typhus spread rapidly among the Strokestown emigrants. Daily, corpses were hauled up from the holds, covered in old sails or meal-sacks stitched together, weighted down, and then “buried in the deep without the rites of the Church.” Three of the Flood children (Bridget, Edward, and Mary Jr.) who succumbed to typhus en route were dropped overboard. By the time the Virginius laid anchor in the St. Lawrence River next to the Grosse-Île quarantine station on July 28th, one third of its passengers had met the same fate. Those who survived the voyage faced further adversity on disembarkation in Quebec. Dr. George Douglas, medical superintendent of Grosse-Île, described the Strokestown emigrants as “ghastly yellow looking spectres, unshaven and hollow cheeked, and, without exception, the worst looking passengers I have ever seen; not more than six or eight were really healthy and able to exert themselves.” Five-year-old James Flood Jr. was among the few who emerged from the hold of the Virginius in relatively good health, but the fate of the remaining members of his family is unclear. At some point between their inspection at Grosse-Île and James’ arrival at Montreal’s waterfront several days later, the boy was separated from his family, possibly during the chaotic sorting process at the quarantine station or at some stage in the 50 kilometre voyage upriver aboard one of the crowded steamers, which carried 70,000 Irish migrants along with a typhus epidemic to Montreal, turning the city “into a virtual Quarantine Station.” It is equally plausible that members of the Flood family were afflicted with typhus upon their arrival in Montreal and were among the 13,189 Irish emigrants who were hospitalized in the twenty-two fever sheds of Pointe Saint-Charles in the southwest of the city, and possibly among the roughly 6,000 who died there and were “buried like dogs in the Hospital pit.” Whatever the circumstances that led to him losing his family, we know that James found himself alone in Montreal, a city under siege by disease. Like many of Montreal’s Famine orphans, James found refuge in the Catholic Church, in his case with the Grey Nuns in the Hôpital Général des Soeurs-Grises. He remained in Montreal’s waterfront neighbourhood very near the dock on which he was deposited in 1847, working as a labourer until 1875, at which point his name disappears from the public record. Colin McMahon’s article has also been reproduced in full in Marguérite Corporaal and Jason King, Irish Global Migration and Memory: Transatlantic Perspectives of Ireland’s Famine Exodus (Routledge, 2016). Minister Heather Humphries, President Higgins, Famine walkers and exhibit curators Christine Kinealy and Jason King. On this first day of the Famine walk, Ireland’s President Michael D. Higgins greeted the walkers and joined them as they set off from Clondra and the commemorative ceremony for the 200th anniversary of the founding of the Royal Canal. A few months earlier, in September 2016, he launched the “Saving the Famine Irish: The Grey Nuns and the Great Hunger” exhibit along with Arts and Heritage Minister Heather Humphreys at the Glasnevin Museum during the National Famine Commemoration in Dublin. The exhibit is curated by Christine Kinealy and Jason King, both of whom are on the National Famine Walk. One of the 1490 Strokestown Famine orphans who was cared for by the Grey Nuns was five year old James Flood, whose story will be told in another post. Famine walker Michael Collins, the Booker-prized nominated acclaimed novelist, is walking in the footsteps of James Flood. President Higgins is the patron of the Irish National Famine Museum in Strokestown and very supportive of its activities, such as the National Famine Walk. The walk was inspired by the museum’s founder Jim Callery’s meeting in the year 2000 with Léo Tye, the grandson of Strokestown Famine orphan Daniel Tighe who was forced to emigrate on the Naomi in 1847. It was also inspired by Jim’s daughter, Caroilin Callery and Maggie Gallagher’s Strokestown-Quebec Youth Connection project that established an arts based cultural exchange between Strokestown and communities in Quebec where orphans from the area had been adopted. Between 2010 and 2012, the project encouraged young people in Ireland and Quebec to learn more about the traumatic historical experiences of their ancestors by teaching them how to research and trace cultural and familial associations between County Roscommon and places in Canada where the descendants of Irish Famine migrants are still living today. It brought together young people from the Strokestown area with students from Laval Liberty High School in Montreal through a variety of multimedia workshops in areas such as film, cinematography, theatre, movement, writing, art, music and historical research techniques. RTE’s Nationwide featured an episode on the “Strokestown-Quebec Youth Connection” project that can be viewed above. The Strokestown youth then travelled to Grosse Île and Irish Memorial National Historic Site in Quebec in 2013, and that same year Richard Tye, Léo Tye’s son, made a return visit to Strokestown as part of the “The Gathering”.